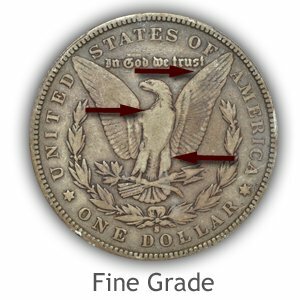 Properly grade Morgan silver dollars by following standards set for the varying degrees of wear found on the coin. Additionally, recognizing the absence of any wear to the surface, indicating a mint state coin, is important to an accurate and higher value. As of 4/22/2019 with silver in the $14.99 an ounce range each silver dollar is valued at $18.09 or higher depending on grade. 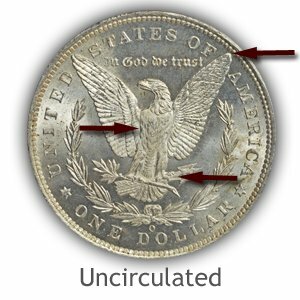 Grading a Morgan dollar requires both a technical approach and a subjective approach. Technically; viewing the amount of imperfections to the surface such as removal of metal due to wear. And secondly; viewing the coin as a whole and judging its overall appeal; nice even color, no large distracting marks is also part of grading. 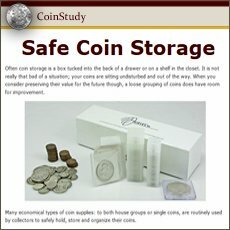 Evaluate each coin individually. 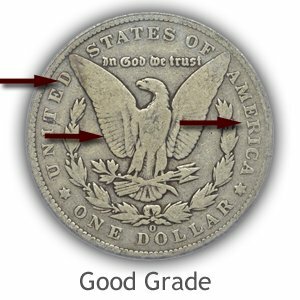 A visual comparison of your coin to the images and video demonstrates these levels of grade. Uncirculated Morgan dollars are coins in the same condition as they left the mint. No wear to the surface has occurred. Identifying these coins is a matter is determining if any wear has removed mint luster from the surface. High points of the design are inspected and evidence of luster remaining and no smoothing to the metal confirms the grade. One of the first places to show wear is the hair near the forehead line just above the eye. Look closely for indications of smoothness and loss of mint luster. Hair above the ear is also high in profile as well as the wave of hair below the ear. Both retain mint luster in the uncirculated grade. Liberty's cheek is both a visual and contact focal point. Prone to wear, inspect the surface closely, wear causes a smoothness and loss of texture. Luster remaining intact across the entire area indicates the mint state condition. Further inspect the cotton blossoms for sighs of flattening and dullness. Liberty's cap at the back of her head is also judged, luster remains on the very top fold. Center of Eagle's Breast: Lack of detail may show because of the height of profile and lack of original striking detail. However no dulling or smoothness, indicating wear, must be present. Edges of the wings near the shoulder retain mint luster. Towards the tips of the wings are subject to first wear, judge luster remains. Area of the Eagle's head; above the eye, beak and neck feathers are all bright with texture and luster. Central areas of the legs display no dulling or smoothness. Luster covers the fine details of the feathers without any flattening. Talons all remain rounded and mint frost is still visible. 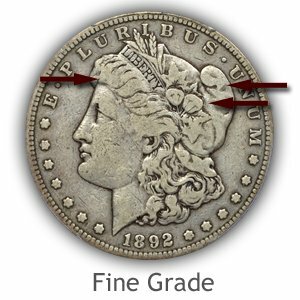 Light wear is beginning to show over the entire surface of a Morgan dollar grading Extremely Fine. Liberty's cheek has lost all evidence of mint frost. Small flat spots now replace the rounded tops of the high areas. 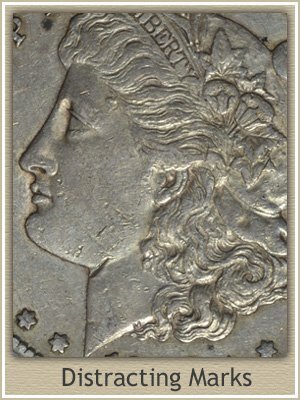 Key areas of fine detail do remain and many dates and mints of silver dollars in the Extremely Fine grade are well received by collectors. Hair above Liberty's eye is flattened in small areas. Most of the fine strands remain giving the design a well detailed appearance. Above the ear is a worn flat area developing. The wave of hair behind and below the ear is beginning to show flat spots, however many fine strands remain with few merging. Liberty's cap at the very back show a small flat area on the top of the once rounded fold. Liberty's cheek is now without luster but retains the original contours with very little evidence of flat areas. Cotton blossoms show minor flatness along the upper edges. Leaves are worn only along the outer edges with central detail remaining. Judge first the eagle's breast. Many of the fine feather details have worn and merged slightly, however the a contoured appearance must remain. Legs of the eagle still display ample detail with flattening evident only along the inner edges. Each talon now displays a distinct flat spot on the uppermost area. Original detail is missing replaced by a flat area. Each talon is separated and distinct from the rest. Minor areas of flattening are confined to the top of the eagle's head, beak and center of the neck. 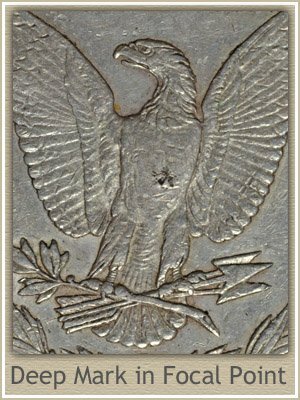 Feathers of the wings are all separated on Morgan dollars that are solid for the extremely fine grade. 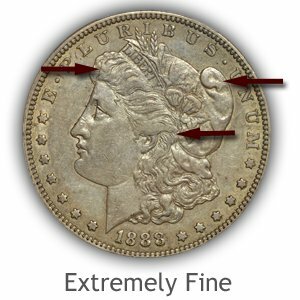 Wear is evident and has cause areas of flatness to the surface of the Fine grade Morgan dollar. However due to the depth of the design elements many details remain strong. The obverse portrait of Liberty is well detailed with a distinct cap and flowing hair. On the reverse a bold eagle remains including the majority of wing detail. Liberty's hair above the forehead displays wide flat areas. Distinction between major waves of hair remains. A full hair line remains separated from the forehead from above the eye to the ear with only minor fading with the cheek near the ear. Liberty's cap although flattened overall still retains separation of the folds and from the cotton blossoms. Leaves above and below the cotton blossoms are still outlined with just slight merging with the cap. Above the headband, grains of wheat are separated and leaves are well outlined. Eagle's breast is now fattened, separation remains from the legs. Wing feathers at the ends are now smooth but majority remain separated. Minor merging of feathers is confined to the upper portion of the wings. Eagle's legs are flattened from wear with small roundness to either side. Leaves of the laurel wreath from below the eagle up to the sides are smooth with just minor merging. 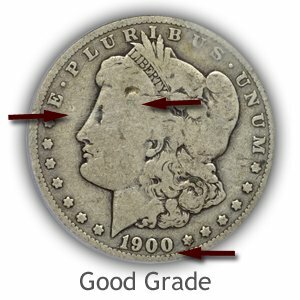 A Morgan dollar in the Good grade may be at the low end of the grading scale; however it does still retain ample detail to have a pleasing character. To many collectors the good grade is equivalent to OK. Heavy with wear true, but not "worn out" describes the coin well. Liberty's hair line has merged with the forehead. Most of the lines separating the hair strands above the forehead and to the ear have also merged. Rim must remain separated from the date and lettering. In some areas the rim is weak and faded. Entire outline of Liberty is complete and raised from the field. Any fading into the field indicates a coin in less than Good grade. Date and all Lettering is complete and full. Eye, ear and lips remain visible as well as an outline to the cotton blossoms above the ear. Outline of the Eagle is bold and separated from the field the lettering and rim. Feathers in the lower half of the wing close to the body remain with both vertical and horizontal lines showing. Rim is complete with areas of faint separation from the field; lettering is complete and not faded into the rim. Strong separation of the rim from the lettering indicates a initially well struck coin and solid for the grade Morgan dollar. Two approaches to grading help in both an accurate grade and ultimately an accurate value. First is a conservative judgement of the wear and surface preservation of the coin. Knowing what details were initially part of the design and visually seeing them on the current coin is important. As example; Liberty's hairline separating the forehead is critical to determine a Fine grade from the Good grade. Avoid "seeing" a faint hair line and possible optimistic judging of the coin. Secondly, as a final part of grading, judge the coin from a collectors point of view, as if you were about to spend money on the coin. Using the example of Liberty's hairline; is the line absolutely there thus worth the Fine value. Aesthetics also forms an important consideration of the worth to a silver dollar. Overall eye appeal is part of the attraction to coin collecting. In any grade your silver dollar has a certain eye appeal. When first minted, silver dollars are bright white-silver with brilliant luster. As time passes the normal reaction of the metal, if exposed to the elements, is developing a toning. A lightly circulated coin that has lost mint luster naturally develops a soft grey color often mixed with a blue or tan tint. Continued unprotected exposure deepens the grey to a dark charcoal shade sometimes very dark. Visual eye appeal is combined with personals tastes. Deeply toned, dark Morgan dollars may not be favorable to some collectors. Moving into a close-up view of the coin's surface, judge for any distracting marks. 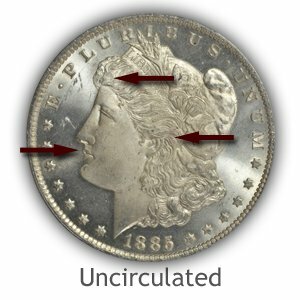 Small marks are the norm for coin the size of a silver dollar. However, any marks large enough to catch the eye need critical judgement. Imaged is the face area of Liberty. Located at the chin and neck line is a sharp, large cut into the surface, part of a grouping of marks. Just above this mark is a smaller, similar mark, both are much larger and deeper than any other abrasions to the area. An accurate description of the coin would include; "nice original color and lightly worn with a grouping of abrasions to the cheek and chin of Liberty". Imaged is the reverse of the Morgan dollar. With a close-up view of the Eagle; a mark in the center of the breast is evident. In a prime focal point; such a deep and comparatively large mark is noticeable. Judging the value of such a mark has a few subtle variables. If this coin is side by side with another without the mark to the breast area the effect on value is clearer. 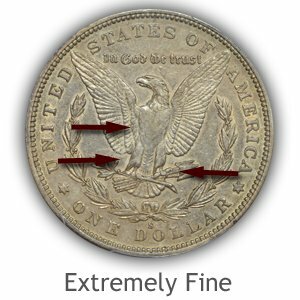 Technical grading of Morgan dollars combined with judging the visual appeal of each coin gives a confident insight to value. Handle you coin with care, add nothing to the surface. Additionally, cleaning the coin is never necessary, remove nothing from the surface. Values of these old coins are listed by Date | Mint Mark | Condition. Different grades of condition are valued separately and appear on the chart. US coin values. Compare your coin to the image links leading to value charts. Determine the date then mint mark of your coin. Follow the descriptions to judge its condition and find the values listed on the chart.